Why can Africa not feed itself? Millions of Africans go hungry every day, making the continent the world’s most food-insecure region. Women and children are particularly at risk. Grain yields remain well below the world average. Low productivity, inadequate policies, and chronic underinvestment are at the heart of Africa’s food and nutrition insecurity and the prevalence of extreme poverty. However, Africa has the potential to become the world’s agricultural powerhouse. It contains much of the world’s remaining uncultivated arable land. The Kofi Annan Foundation seeks to empower smallholder farmers to unlock Africa’s Agricultural potential. The Kofi Annan Foundation encourages the public and private sectors to increase investment in agriculture, and implement evidence-based policies that will enable smallholder farmers to turn their subsistence farms into profitable businesses. To boost this endeavour, the Foundation convenes the African Food System Initiative, a network whose members are deeply involved in Africa’s food sector. It assists smallholder farmers to increase productivity, enter the value chain, and produce commercial surpluses. The Initiative is composed of leading African and multinational corporations, philanthropic organisations, civil society institutions, and global food agencies with expertise and experience in agriculture, food security, and nutrition. enable commercially viable and sustainable smallholder farmers, especially those producing staple crops and nutritious foods, to participate in markets and value chains. persuade larger companies and food agencies to source more of their supplies from smallholders. provide opportunities for women, young smallholders and agro-entrepreneurs. 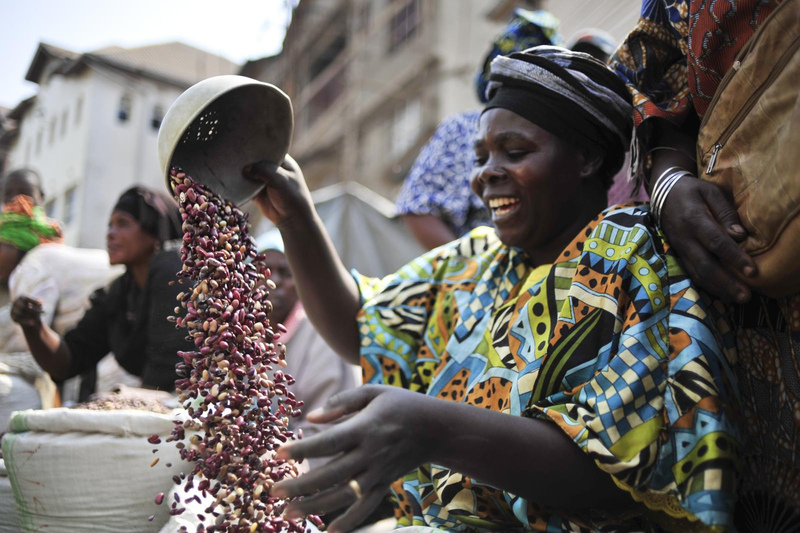 increase intra-African trade in agricultural commodities and improve regional integration. strengthen the ability of smallholders to manage climate-related risks and shocks while improving the natural resource base. Empowered, smallholder farmers can lift their communities out of poverty and help make Africa the world’s breadbasket. For that they need easier access to markets, credit and insurance, and access to climate-smart inputs and modern technologies. By developing partnerships with smallholder farmers, governments and the private sector can fill many critical gaps along the entire value chain. Where the climate changes, only farmers who have the resources to adapt will be able to overcome the challenges and preserve their livelihoods. Smallholder farmers are the key to unlocking Africa’s agricultural potential. For all the progress made in recent years, it is difficult to understand why Africa, which has the world’s largest reserves of uncultivated arable land, continues to suffer from under- and malnutrition and spend billions every year on importing food. The Kofi Annan Foundation convened the African Food System Initiative to end this anomaly. The objective is to create an environment more conducive for smallholder farmers, enabling them to transform their ventures into successful businesses and lift themselves and their communities out of poverty. We mobilise companies, political leaders and civil society to advance food and nutrition security in African and beyond. Placing the smallholder farmer at the centre of our efforts, we work to unlock Africa’s agricultural potential. In this video message, Kofi Annan underlines the ways that hunger and competition for agricultural resources can exacerbate social tension and calls for a more holistic way of thinking about food security and peace. Kofi Annan recorded it in support of the UN’s Food and Agriculture Organization’s (FAO) initiative to tackle the twin problems of hunger and violence through a new alliance launched in May 2016.